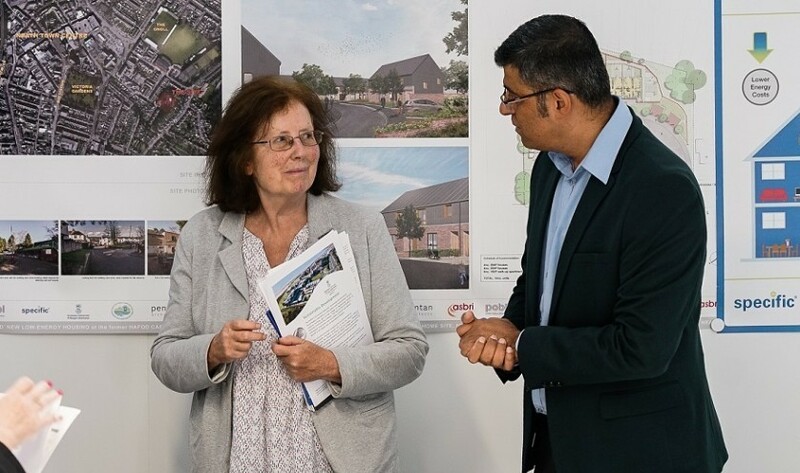 On Monday 18th June 2018, Dr Khalil Khan, Project Manager of the METaL Project welcomed Julie Morgan, Chair of the European Structural Funds Programme Monitoring Committee and Welsh Labour Assembly Member for Cardiff North, to Swansea University’s Bay Campus for a ‘Sustainable Development’ visit. With a focus on cross-cutting themes such as gender equality and environmental impact, the visit incorporated discussions with many of the EU supported projects housed on the campus. The day started with introductions in the SPECIFIC IKC Active Classroom; this is the UK’s first energy positive classroom, a facility which is capable of generating more solar energy than it uses. Professor Johann Sienz, Deputy Head of the College of Engineering, and Director of Innovation and Engagement, led the talks and focused on the recent growth of the University. Professor Sienz is Director of the ASTUTE 2020 project, a team of world-class academics and highly qualified technical experts collaborating with industry to address manufacturing challenges, supported by the European Regional Development Fund (ERDF). The group then enjoyed a tour of the University’s College of Engineering, where the METaL Project introduced Mrs Morgan to two guests from Tata Steel Port Talbot, Lucy James and Andrew Townsend. Lucy is an Environment & Community Support Specialist who had recently attended METaL’s Environmental Impact & Sustainability course, and Andrew is a Fire & Environment Manager, who helped develop the course content. Both Andrew and Lucy were able to discuss with Mrs Morgan why they consider METaL training programme to be so beneficial for local industry. Following this discussion, Dr David Warren provided the group with an introduction to the M2A programme. The Materials and Manufacturing Academy (M2A) provides industry led postgraduate research training, and like METaL, is supported by the European Social Fund. Mrs Morgan had the opportunity to meet some of the current M2A students and discuss the exciting projects they are involved in. Professor Sienz gave a more detailed insight into the ASTUTE 2020 project, providing the AM with case studies for some of the companies they have collaborated with. Mrs Morgan was then given an overview of the new IMPACT building by Dr Anke Heuberger, IMPACT Operation Manager, which is currently under construction and forms part of the College of Engineering as a semi-autonomous Research Institute. SPECIFIC IKC’s Dr David Bould and Dr Justin Searle concluded the tour back at the Active Classroom – explaining the building’s capabilities to the AM, and giving an insight into the future of ‘Buildings as Power Stations’. Mrs Morgan also spent some time at the new Computational Foundry, an ERDF supported project which is currently under construction at the Bay Campus and aims to establish an internationally renowned, digital ecosystem for world-class computational science research. The future of successful funded programs, such as METaL, post-Brexit is very high on the Welsh Government’s agenda, and following Julie Morgan’s visit, the issue was raised at the Senedd question time with Cabinet Secretary Mark Drakeford. METaL would like to extend their thanks to Mrs. Morgan for her time and ongoing support of the University’s European Funded projects.